The 1998 season at the Orchard Pit began by clearing out the debris that was left over from our limited work done in 1997. 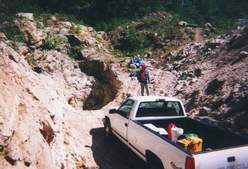 1997's activites had been primarily at the eastern end of the pit where a 'burn hole' had been put in at the headwall. The '97 effort had been quite productive producing large quantities of blue beryl in matrix with an occasional piece of aquamarine. In this photo Doug Smith is standing at the bottom of the hole using our Punjar gas drill. The wall at that spot was dense with blue beryls in matrix. 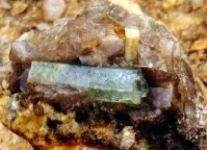 While clearing out just in front of the this hole, a piece of feldspar was chiseled up revealing a 10 cm gem green beryl. Unfortunatley as the water within the piece evaporated it became apparent that nearly all of the specimen was factured. It was now unavoidable that if any serious work was to be done at the Orchard an equipment access would have to be opened at the western of the pit. With the help of Gary Laverdere, the dirt was cleared from the front of the pit and an access road started. A substantial piece of ledge would have to be removed in front as well. Suprisingly this material directly in line with the strike of the pegmatite seemed to be devoid of any mineraliztion of interest. This portion consisted of metamorphized schist ,'green feldsapr', very little quartz and only a occasional albite vug. Originally this was viewed as a negative but as this pattern was to repeat itself later in 1999. It now seems to carry a more positive indication. The first series of benches at the western end of the pit yielded little except for a few smokey quartz crystals. As we progressed further towards the head wall and about where the pickup is in the photo we began to encounter beryl in matrix. While drilling the next series of benches and about in the center of the peg a six foot drill dropped into a pocket at about the 5' level. Doug Smith stemmed the bottom of this hole with peastone to prevent the blast from entering the pocket. The side of the left side of the pit wall was marked to indicate the location. This blast produced quite a bit more of yellow and green beryl in matrix. As the cleanup progressed the stemmed pocket was found. 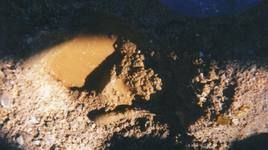 It was filled with a reddish wet clay and as we scooped it out into a pocket we could feel the occasional lump. The clay, the consistency of window putty, made it impossible to see what the lumps were. After having filled perhaps 1/2 of a 5 gallon pocket,we energetically debated washing a little bit of its contents. Fortunately our burn hole was a handy resevoir for this purpose. Doug reluctantly went over the banking to do the washing. Soon Doug's voice echoed up out of the hole. "Don't throw any of that stuff away!!!" Our window putty was filled with fragments of etched golden beryl. The Golden Beryl Pocket of '98 The golden beryl pocket was perhaps the size of a football vertically and had several radiating chambers or cracks. These cavaties produced more fragments of golden beryl. All of the pieces were of larger crystals that had paid the price of dissolution. Some were quite gemmy however. Many displayed clearly the characteristic etch patterns for beryl. It is as if the crystal is dissolving into its component crystal units revealing its internal symmetries. These pieces even though quite etched maintained their gemmy luster on external surfaces. 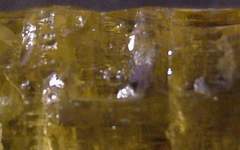 The inset close-up is from the center crystal in the group above. It is every miners dream to open a pocket and still have the gem crsytals radiating from the pocket walls. 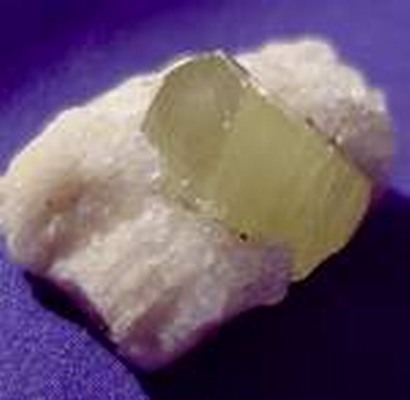 The small beryl on albite is a close as we were to get to such an fantasy in 1998.